For many years, the 70-200mm focal range has been seen as one of the key battlegrounds over which manufacturers compete. It is such a useful focal range that the reality is there is almost no genre of photographer that will not benefit from having a lens of this range in their bag. Generally, lenses of this focal range feature a constant maximum aperture, either f/4 as is the case here, or the more expensive versions at f/2.8. Designed for full-frame (FX) sensors, AF-S 70-200mm f/4G ED VR lens will also work on a DX sensor camera, offering a 105-300mm equivalent focal length. The lens also features three of Nikon’s top technologies – a Vibration Reduction (VR) system to allow you to shoot handheld at up to five stops slower than normal, a Nano Crystal Coat to minimize ghosting and flare and a Silent Wave Motor (SWM) for fast, quiet autofocus. Mounted to a Nikon D3x, the AF-S 70-200mm f/4G ED VR scores 19P-Mpix making it one of the sharpest 70-200mm telephoto lenses available from any manufacturer. The only other lens that comes close is Canon’s EF70-200mm f/2.8L IS II USM lens at 18P-Mpix, but it comes at a price that is more than $1000USD higher. Good scores almost across the board show the AF-S 70-200mm f/4G ED VR to be a high performer overall and mark it out as a very good lens, especially given its relatively low price. Looking at the DxOMark score rather than the P-MPix metric, the lens scores 23 overall. Again, for lenses with a focal length of 70-200mm, this is only bettered by the Canon lens mentioned previously. Taking each of the lens testing metrics in turn, we can see quite why the overall score is so good. First up, the sharpness – the P-Mpix score of 19, on a camera that offers up to 24.5Mpix, shows that the lens is performing very effectively. Even when shooting wide open at f/4, the sharpness is even right across the frame. Even looking at the most ‘testing’ scenario for a zoom lens – a wide open aperture at the shortest focal length – the Nikon AF-S 70-200mm f/4G ED VR shows completely even sharpness right across the frame. Scoring 4.4TStop in the transmission tests is also impressive, especially for a zoom lens. It shows the optical design of the lens is very good, allowing high levels of light transmission relative to the stated maximum aperture of f/4. As expected for a zoom lens, the AF-S70-200mm f/4G ED VR does show some distortion both at the wide and telephoto ends of the range (barrel and pincushion respectively). However, it is pretty well controlled and through the middle focal lengths of the lens it is almost completely absent. Even where there is some distortion though, it is never bad enough to be considered a problem. The chromatic aberration score also shows the lens to have a good optical design. A score of 7 means there is some chromatic aberration, but in reality it is likely to be around 1pixel wide in a final image – certainly not enough to be a distraction or cause for concern in print. The only area that lets this lens down then, is the vignetting score. At all focal lengths when shooting wide-open at f/4 there is more vignetting than is ideal. However, as soon as you stop the aperture down to f/5.6 or smaller, the vignetting almost completely disappears, so unless you plan on shooting at the maximum aperture all the time, this is not something to be unduly concerned with. The 70-200mm focal range is a hotly contested area, so it makes sense to compare this lens to others of the same length. 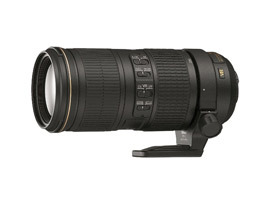 Here we’ll compare it to another Nikon lens, this time the faster f/2.8 version as well as a Canon lens, the EF70-200mm f/2.8L IS II USM. Looking first at sharpness, the Nikon f/4G and the Canon lens both perform very well at all apertures, with the Nikon lens just having the edge overall. Though this could easily be explained by camera choice as well. In essence, there is little to split them. Looking at the Nikon f/2.8 lens it matches the other two at 70mm and 80mm but there is a loss of sharpness in the corners between 100mm and 200mm that accounts for its lower score. If we were only to compare the centre of the frame, there would be very little to choose between the three lenses. In terms of distortion, there is little to choose between them. All three lenses exhibit minor barrel distortion at the wide end and minor pincushion distortion at the telephoto end. Through the mid focal ranges though, they all perform well with no noticeable distortion. Looking at the transmission scores, it’s no surprise that the two faster lenses, the Nikon f/2.8 and Canon f/2.8, score higher than the AF-S 70-200mm f/4G ED VR – in fact, it would be very odd if they were to perform worse given their wider maximum apertures. While the Nikon f/4 lens loses out here though, it’s worth bearing in mind that it is the cheapest of the three and generally as price goes up, so does the maximum aperture of the lens. The story is the same when looking at the chromatic aberration scores – none of the lenses exhibit noticeable CA although if we have to pick a loser, the Nikon AF-S VR Zoom Nikkor 70-200mm f/2.8G IF-ED does show a fraction more than the other two lenses in the corners when shooting at 70mm. It’s basically the same with the vignetting tests – the Canon lens and the Nikon f/4 lens are very closely matched, with the Nikon f/2.8 model fairly slightly less well. In this case, there is a loss of around 1/2stop in the corners, which may be an issue depending on what subjects you shoot – landscapes for example may show this vignetting in areas of even toned sky, but with sports or wildlife, where the toning of the background is less likely to be even, it is unlikely to detract unduly from the final results. Beyond the lens testing metrics, the Nikon AF-S 70-200mm f/4G ED VR not only performs as well as, or better than the other two lenses here, but it is also around half the weight of the other two and at least $500USD cheaper at list prices. The choice between the two Nikon lenses comes down budget and how much the faster maximum aperture is worth to you. The Canon lens shows what is possible with an f/2.8 lens, but it is so closely matched in performance by the Nikon f/4, it does not offer a compelling reason to choose one system over the other. The Nikon AF-S 70-200mm f/4G ED VR shows itself to be a remarkably good performer. If you are a Nikon user and are in the market for a 70-200mm focal range lens, it makes a great case for serious consideration with high scores in all lens test metrics and a price that is much lower than expected for the performance on offer. It does seem hard to suggest a lens costing over $1000USD can show value for money, but in the case of this lens, it really does. In the battle of 70-200mm lenses, it is only out-scored by the Canon EF70-200mm f/2.8L IS II USM that is almost double the price.